Early this week, I finally had an opportunity to check everything out at the salt marsh. In broad daylight. But that didn’t spare me from bumping into some covert operations. 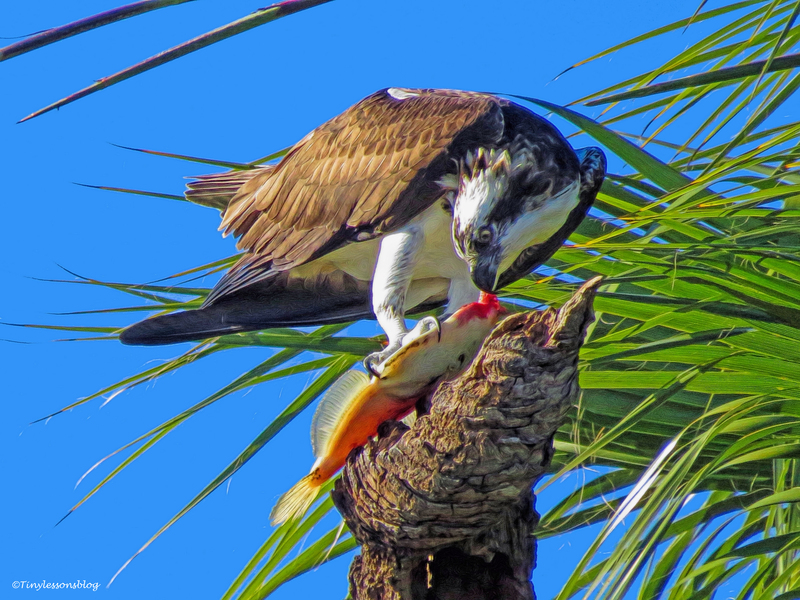 By the osprey couple. The main target of my surveillance. When I arrived at the marsh I found Mama Sandy on one of her regular breaks from incubating. Papa Stanley was sitting on the eggs. She was looking well and happy to air her brooding patches for a while. It’s been over five weeks now, which means she has endless patience and that addition to the family is imminent. She flew back to the nest and immediately sat on the eggs. The shift change was seamless. Thirty seconds tops. Stanley flew away and I saw him dive down into the marsh waters behind some trees and bushes, pick up a fish and fly away to eat it. They almost never fish at the marsh, so I believe this was a surprise maneuver to distract the paparazzi. And he succeeded. No pictures. You just have to take my word for it. As everything was quiet at the nest, I continued my inspection round. The first friend I spotted was the Mayor. As always, he was keenly surveying the marsh. I’m almost sure he has a nest close by. I have seen him fly with nesting materials only to land in the middle of the marsh. And I’ve caught him returning there at night. But he keeps his family secrets close to his chest. 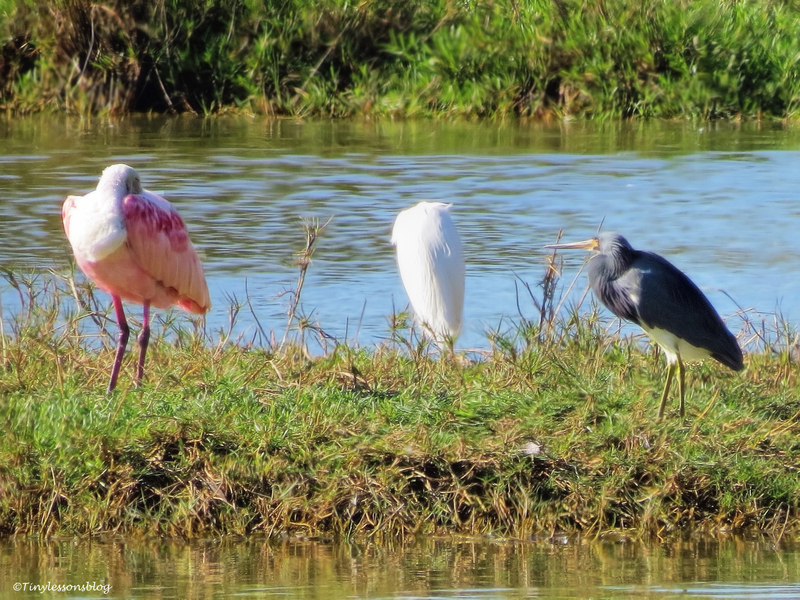 And so does the Tri-Colored Heron family. 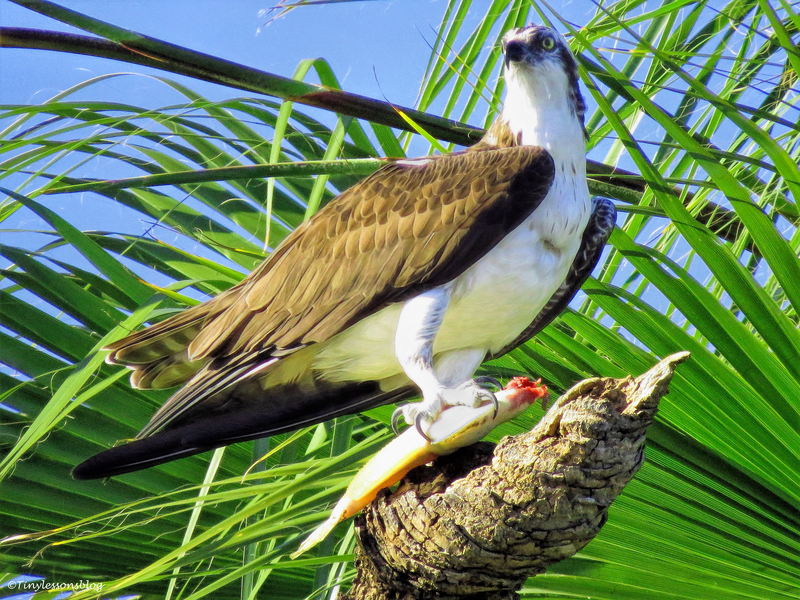 I have figured out that the male likes to hide in the trees below the Osprey nest, while the female practices her yoga whenever she has a break. I spotted the male first. A half an hour later, Mrs. was out and about stretching her wings and airing her brooding patches on one of the islets. Another couple nesting at the marsh now are Mr. and Mrs. Yellow-Crowned Night Heron. Apparently Mister had been fishing. 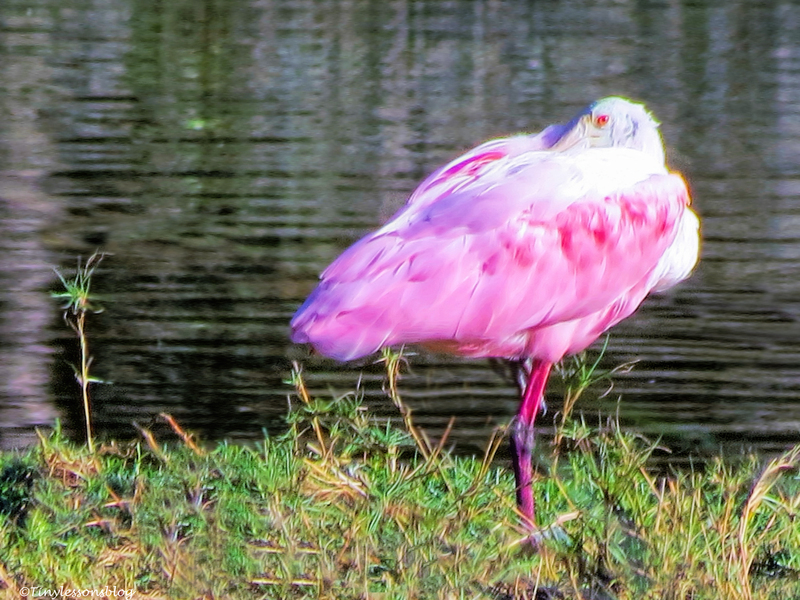 He was drying his feathers in the sun. I also saw my friend Little Blue Heron. I am almost sure she’s not yet mature enough to start a family. The same probably applies to the really tiny Snowy Egret, who was observing the wild world from a tree next to the deep water. Suddenly I heard Sandy’s alarm call. 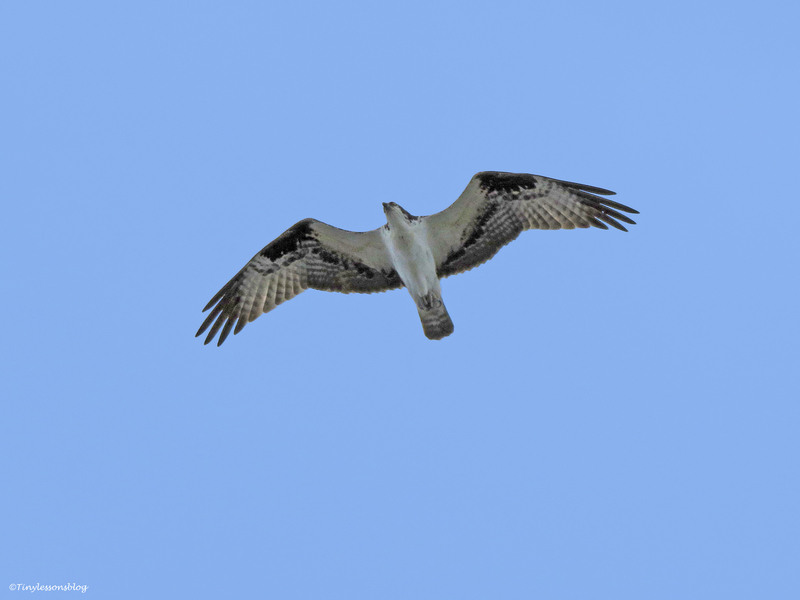 I looked up and saw another female Osprey circling above the nest. I assumed she was the wife of Stanley’s fishing buddy, Steve. 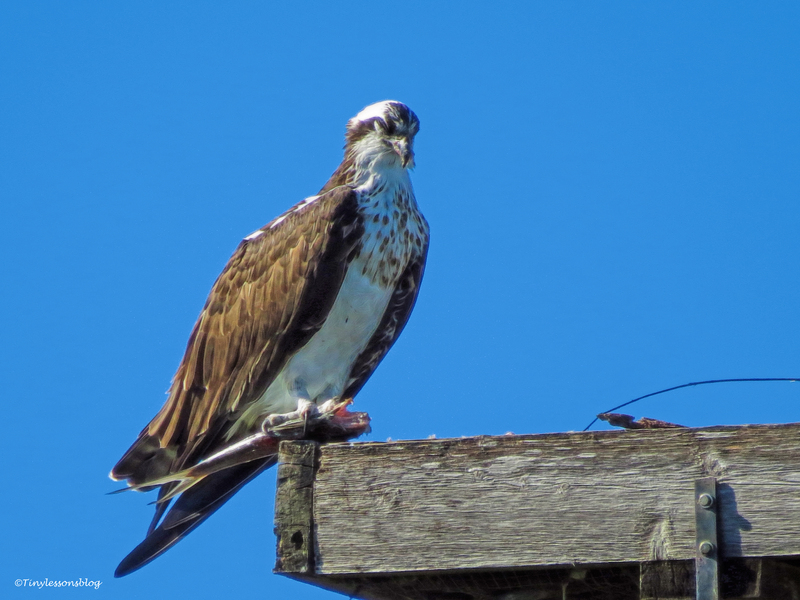 They are nesting on the roof of a high-rise building about one mile south of the marsh. Perhaps she was on a break to stretch her wings and was curious about the trendy furnishings in Sandy’s new home. She was not aggressive in any way and Sandy soon calmed down. I continued my walk and saw that the Reddish Egret was visiting. He might have been looking for some special bites to take back to the bird island, where I’m assuming he’s nesting right now. Next, I saw a duck that I haven’t seen at the marsh for a couple of years, a male hybrid between Mallard and Florida Mottled Duck. It looked like he was canvassing suitable home sites. 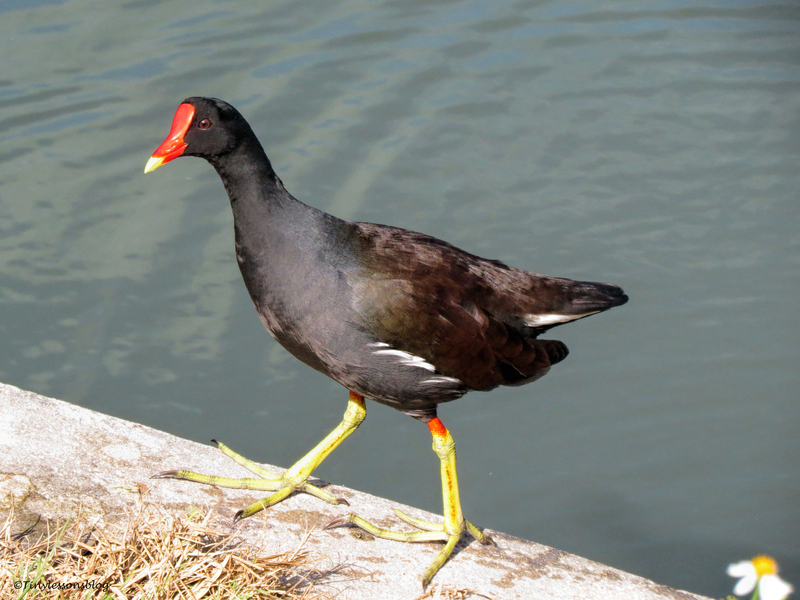 He had some completion from Papa Moorhen. Although I think the Moorhens have already rented a home for this nesting season. Mama Moorhen was likely already incubating at this time. But where were all the smaller birds, you might ask. Oh, they were flitting and flying around in big numbers. The super tiny Sedge Wren was foraging in the grass, hardly visible beneath the leaves. The Blue Jay was flying around singing his monotone song – and moving non-stop. The Mockingbird’s song was not boring. He had a large repertoire that I greatly enjoyed. The European Starling, the Grackle and the Eurasian Collared Dove just sat there admiring the gorgeous spring weather. 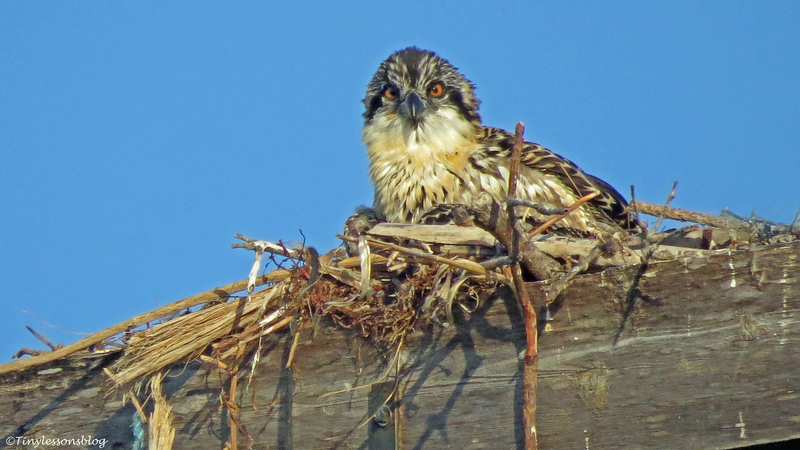 I had to walk home not knowing whether or not there was a little hatchling in the Osprey nest. Then, on Thursday afternoon, I was spying on them again…from my terrace. Sorry for the poor picture quality, but it was so windy that I could hardly stand straight and zooming full out, handheld, is quite hazardous in those conditions. Anyway, I caught a moment when Stanley was sitting on the perch and Sandy was incubating – her wings a little bit spread out. Suddenly she got up and started working on something. I can’t be sure of what she was doing. But when I inspected my blurry and shaky shots at length, it sure looked like she could have been feeding (by regurgitating) a newborn chick…or two. But you know my imagination. Sandy was certainly ‘doing something’ both in front of her and to her side. I have learned that when there is a hatchling, it still looks like she is incubating. Why? She broods the newly hatched chick(s) for 10 days, initially also incubating still unhatched eggs. Her wings are just slightly spread out at that point. As the minimum incubation time has now passed, we could already have one or two tiny chicks…carefully protected from paparazzi by the parents. Whatever it is, we’ll know soon enough. We all wish you a beautiful weekend and week ahead. Fly high. Adieu Lady Cawcaw. Hello Summer. Lady Cawcaw left last Monday. 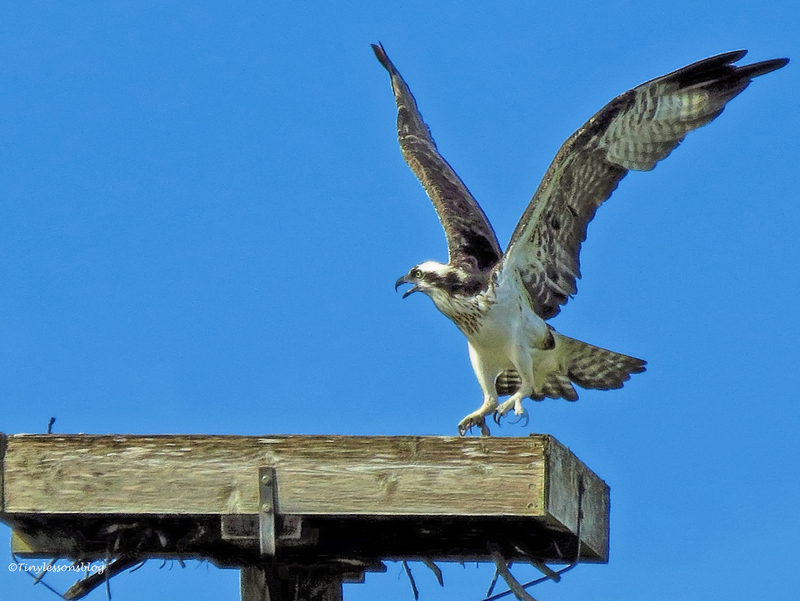 Just like every Osprey chick born at the salt marsh in the past three years, she left exactly one month after fledging. And I haven’t spotted her since. This is the last picture I got of her. She had a full crop and had taken a bath. 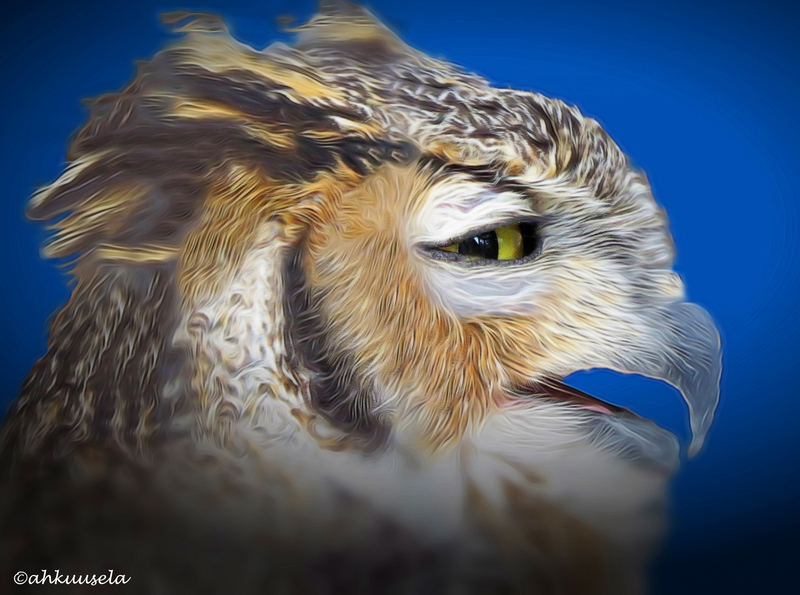 This beautiful bird was ready to take on the big world outside the salt marsh. I wish her the best! And hope to see her again. It looked like the birds were saying their goodbyes to her. 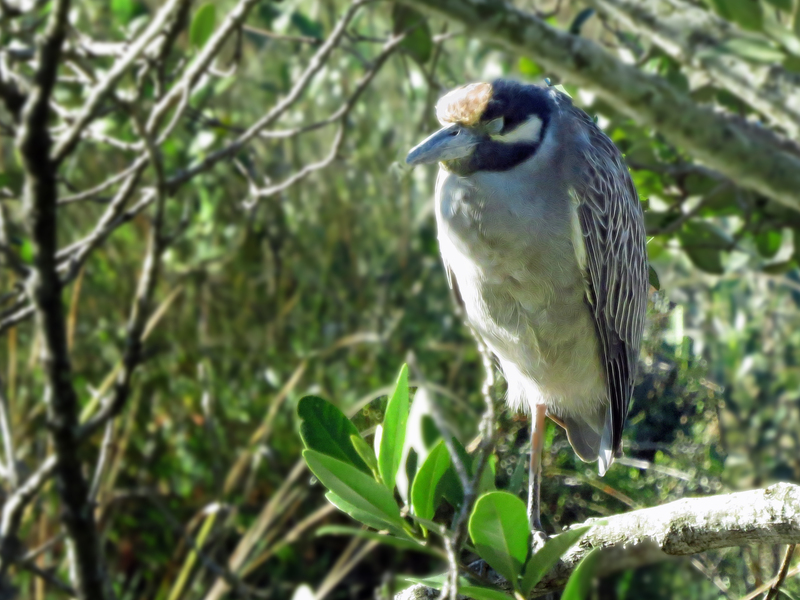 The Yellow-crowned Night Heron peered towards the nest. 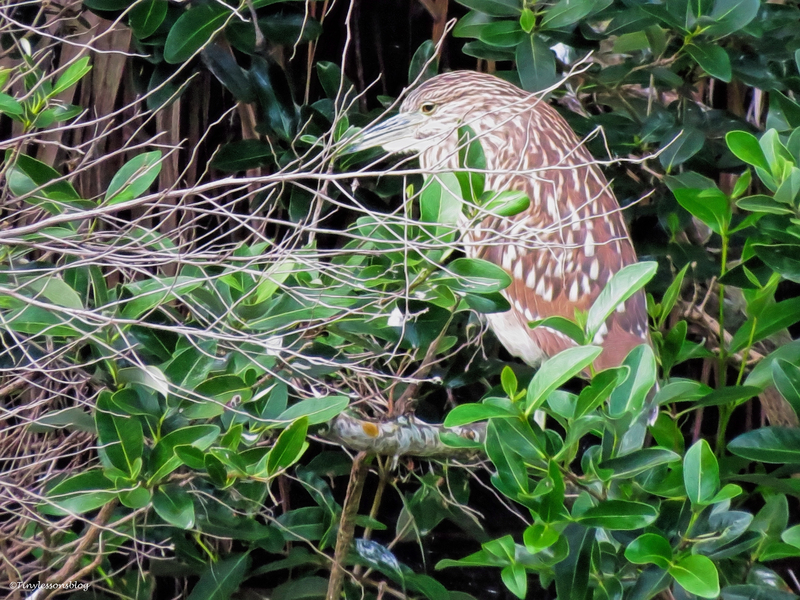 The Green Heron was in deep thought. Maybe pondering how fast the time flies. And how fast the kids grow up. 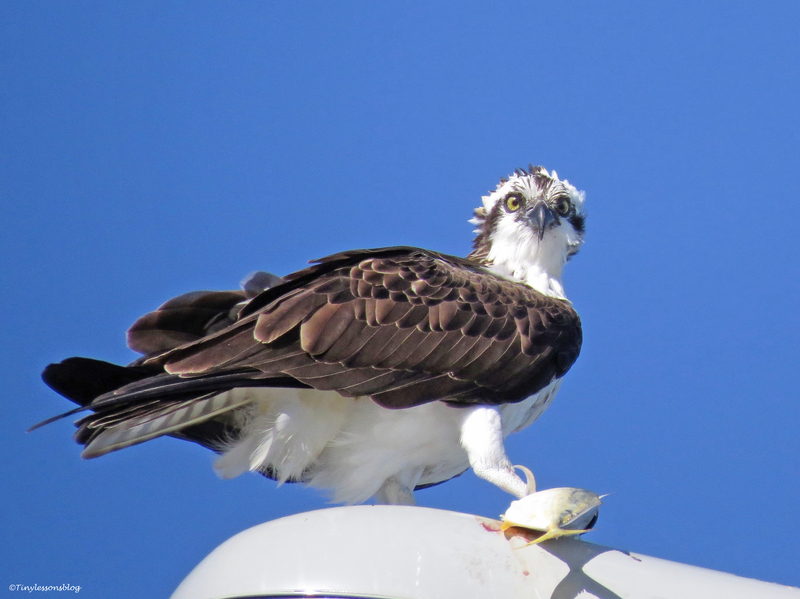 Miss Rosa was on her favorite ‘island’ close to the Osprey nest. She took her customary beauty nap and then walked around looking for food. Life goes on and we all have to eat. That was true also for the Black Skimmer, who was flying around lightning fast and skimming the waters. The salt marsh feels somehow quieter now in the absence of Lady Cawcaw’s performances. The birds go on with their daily chores, but the action has been more low-key. Maybe they miss her. Or maybe it’s the midsummer heat. Mama Sandy has been hanging around the nest for a few hours almost every day since Lady Cawcaw left. On Friday I found her eating a big fish. And Papa Stanley has been around too. They have not gone on vacation this year, like they did last year and the year before. May it be that Lady Cawcaw has stayed somewhere nearby and they are keeping an eye on her? This morning I took another quick walk to see who was at home. 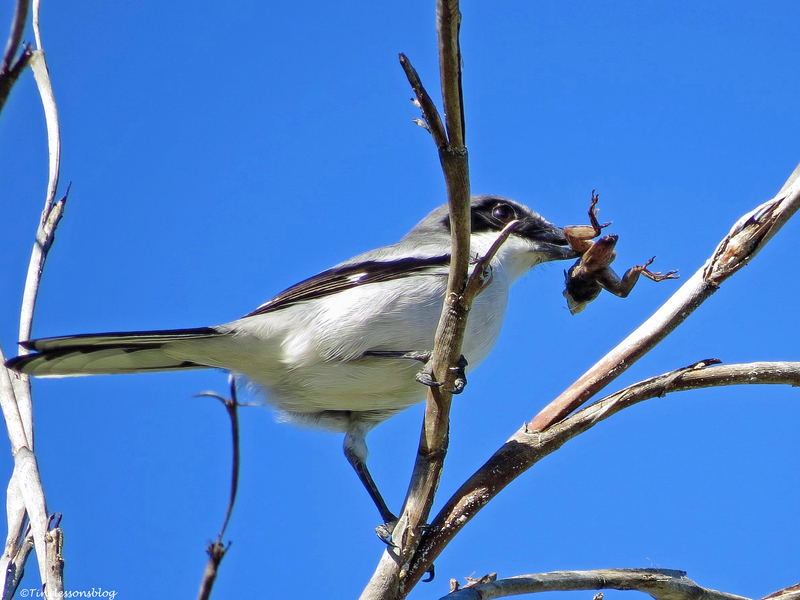 The first bird I saw was the Loggerhead Shrike (or butcherbird), who hasn’t been around for a while. He was scanning for prey. And a Red-winged Blackbird was singing his heart out close to the Osprey nest. Sandy was babysitting the nest. It’s unusual she does that directly after the nesting season, but she must have her reasons. 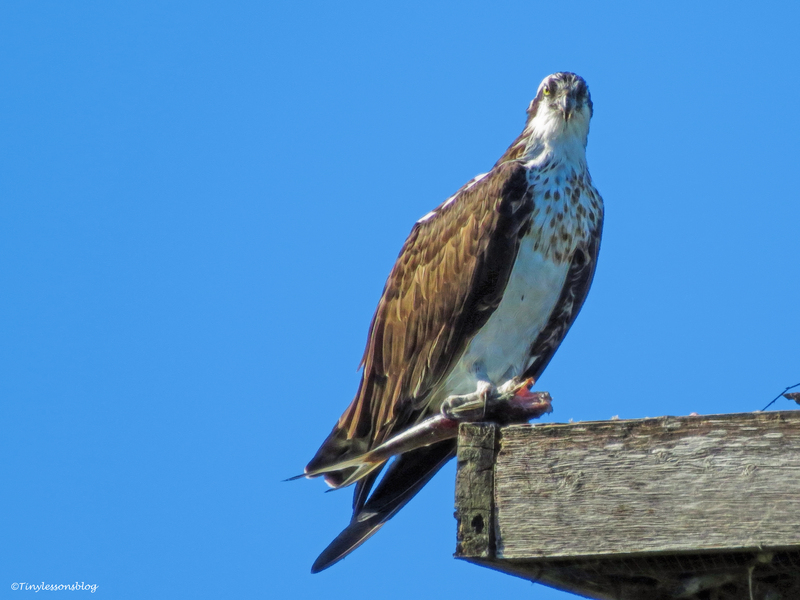 She was keeping an eye on the skies as well as on the young Blue Heron who was very close to the nest. He earned a few warning calls. Again. The Moorhens were out in big numbers. One was doing her beauty routine at a small pond. 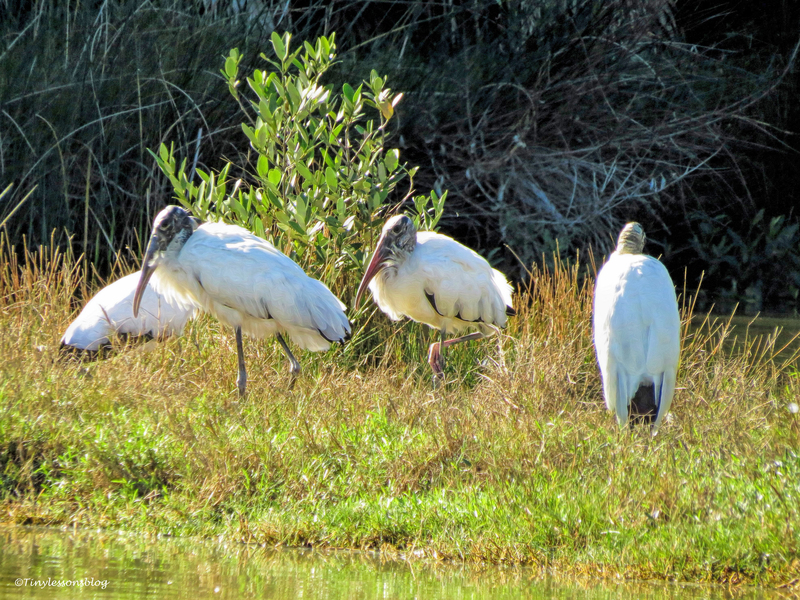 The Egrets were well represented too, both big and small. 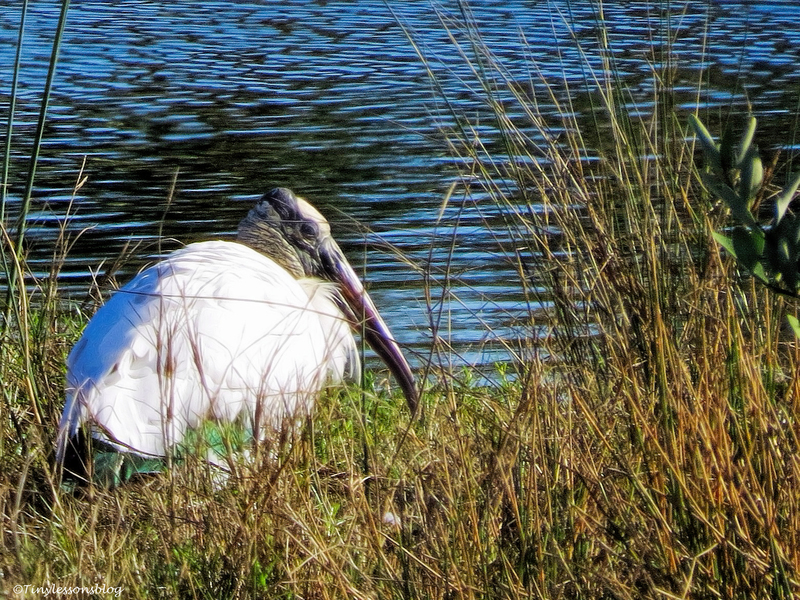 And so were the White Ibis. They had invaded the popular ‘resort island’, and had it all for themselves. But Miss Rosa was represented only by this hot pink marker. Probably left there last night after her evening bath. A feather that was not up to her high standards. This is all from the ‘Salt Marsh News’ for tonight. I have a feeling these news will be broadcasted at a more random schedule over the summer. This reporter will take her summer vacation, which involves various travels. She will still post and read. But it will be more like ‘whenever’ until after mid August. From all of us to all of you: Thank you for being here, have a wonderful week! Enjoy summer! Persuation Time. And Miss Rosa Steals the Show. Lady Cawcaw is still around. During this busy week I have spotted her eating in the nest at least once every day. I have been hoping she had caught the fish by herself, but now I’m leaning towards it having been supplied by one of her parents. And on Friday I witnessed something rare when observing the nest from my terrace. Mama Sandy was eating her fish in the nest, while Lady Cawcaw was crying to get a piece. Or maybe she was hoping for Papa Stanley to come to her rescue. I thought I could hear “where’s my fish, daddy?” quite clearly. It’s hard to listen to your baby cry, I know. But Sandy may have taken this drastic measure in an attempt to persuade the little lady to come on fishing trips with her or Stanley. And I think it might finally be working. While Lady Cawcaw seems to have found a better night perch and has not been spending the nights at the nest anymore, she was there when I arrived at the salt marsh yesterday morning. She was looking up and I saw Mama Sandy was flying above the marsh. Although her crop didn’t look empty, she immediately started to ask for fish. No fish was forthcoming, and after a few minutes she flew away. Supposedly to go fishing, but there is also the probability she went to check on her parents’ whereabouts. I decided to walk around the marsh. It was lively. 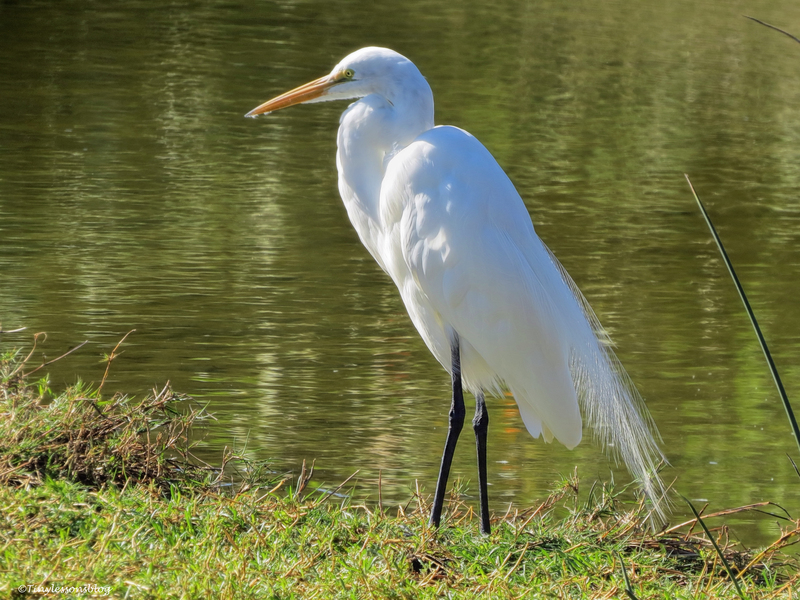 Lots of Great Egrets and Snowy Egrets around. And Miss Rosa was there too! She was in the middle of her elaborate beauty routine. I took a 30 second instructional clip so you can learn how it’s done. Another one of my favorite birds was there too, the Reddish Egret. He was also doing his morning routine. But as soon as he saw me, he made sure I noticed what he was up to: fishing. He was fun to watch. He always is. And he knows it. The Tri-colored Heron didn’t make a big number of his hunting. Actually he was just admiring the view for quite a while. A big junk of my walk was taken up by chasing the Black Skimmer around the marsh. That was fun. 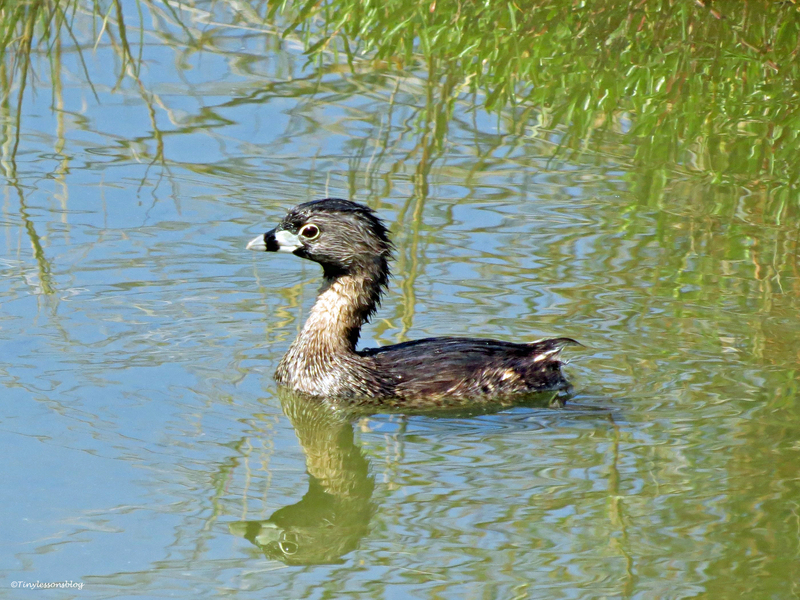 He was skimming the surface of the small ponds. As soon as I got him in focus, he was in another pond. Two thousand steps later, this the best picture I got. …when suddenly a familiar face shot up from the bushes. The young Great Blue Heron looked like a deer caught in the headlights. He decided it was better to move to the other side of the deep water, away from the paparazzo. 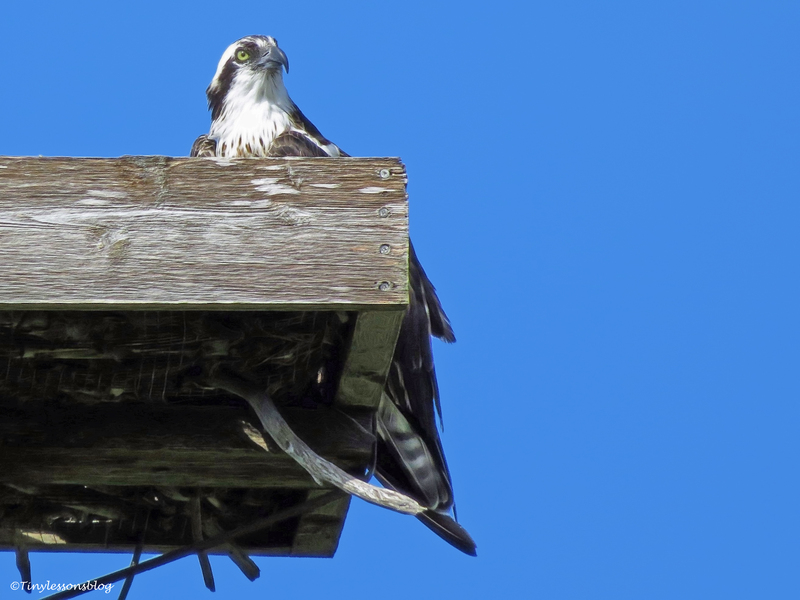 He landed right below the Osprey nest, where some Red-winged Blackbirds were looking for food scraps. 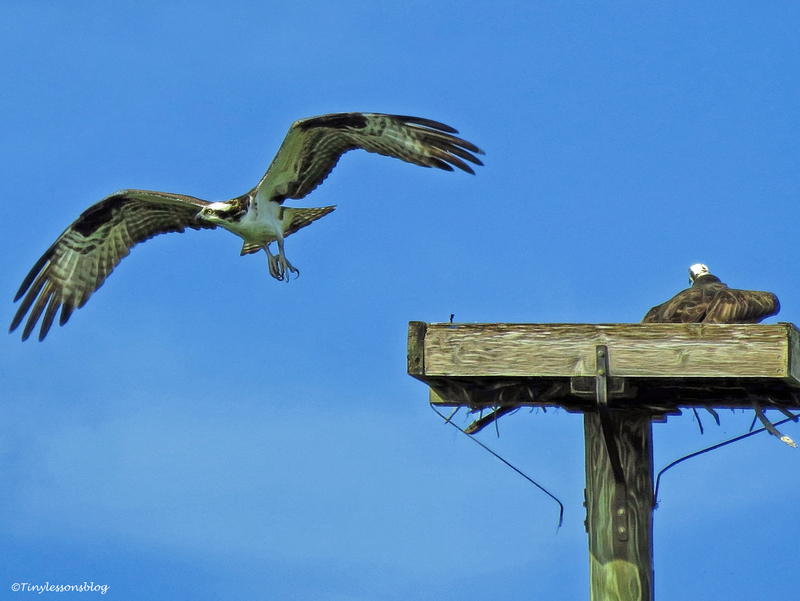 Their enjoyment of the Osprey B & B was cut short by the return of Lady Cawcaw. As you can see, she has now mastered the same landing technique as her parents, coming from below and against the breeze. However, she had not yet mastered how to catch a fish. But now she’d been trying. She shook off the excess water at the nest. Bravo! I could see Papa Stanley perching high up at the fire station next to the salt marsh. He was wet too. I figured he might have been giving diving lessons to his teen. He might have told her something like this: hover over the water to spot the fish you like, size it carefully so it’s not too big for you, then dive in feet first and your talons stretched out, but don’t dive more than about 3 feet deep! That should do it…shortly. While I was walking home on the bay side, Stanley passed me, in the air of course. 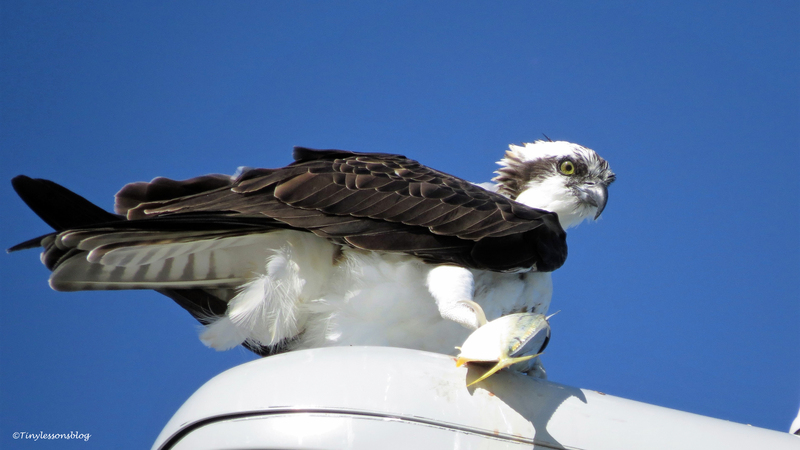 He settled on his favorite spot at the corner of Marriott’s roof and immediately started to scan for fish in the bay. He is a great dad. I wished him Happy Farther’s Day. 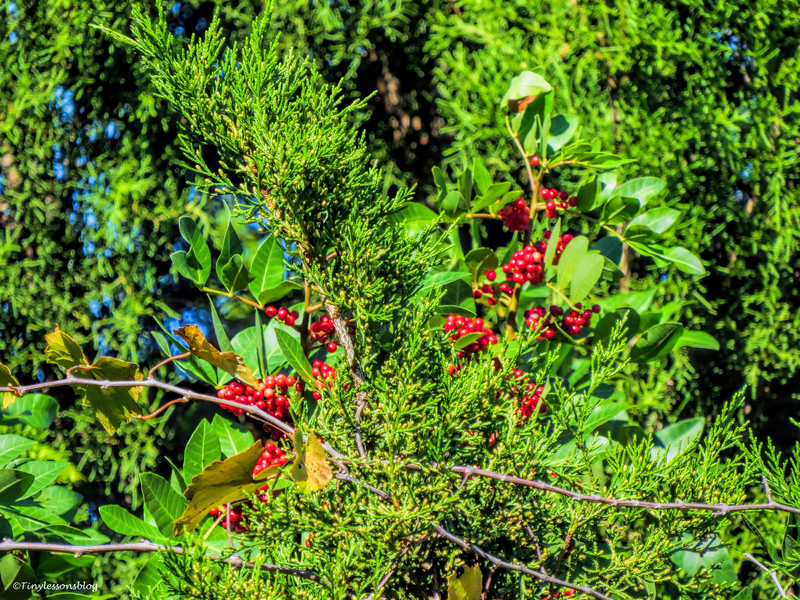 Late in the afternoon, I saw that Lady Cawcaw was eating in the nest. I hoped it was a self-caught dinner. Thank you for coming along. We all wish you a great week. Tough Love. And an Election Rally at the Salt Marsh. I know, Lady Cawcaw gets disproportional coverage in the ‘Salt Marsh News’ right now. But for a good reason. We know she’ll be gone soon. That is, as soon as she learns to fish for herself. Her parents are using tough love to get her motivated. This has been very clear over the weekend. The food portions are smaller and far between. And she’s hungry, her crop is empty. Over the weekend she was away from the nest for hours, I assume hovering over the waters around here. But she always came back without a fish. And immediately upon return told her parents she had tried, but had not been successful. On Saturday, Sandy and Stanley demonstrated their strategy with the teen. Sandy was keeping an eye on the nest from a lamp-post close by. But I saw her finish the whole fish by herself. She had a full crop, as you can see. She was also watching Stanley fly overhead with his pal Steve. You remember him, right? Both of them settled on Marriott’s roof to scan for fish in the bay. I was hoping Stanley would bring lunch for Lady Cawcaw. But the guys were not in a hurry. They just chilled out in the breeze up there. I could hear friendly small talk, two guys catching up on a fishing trip. Although it was partly cloudy, it was very hot. 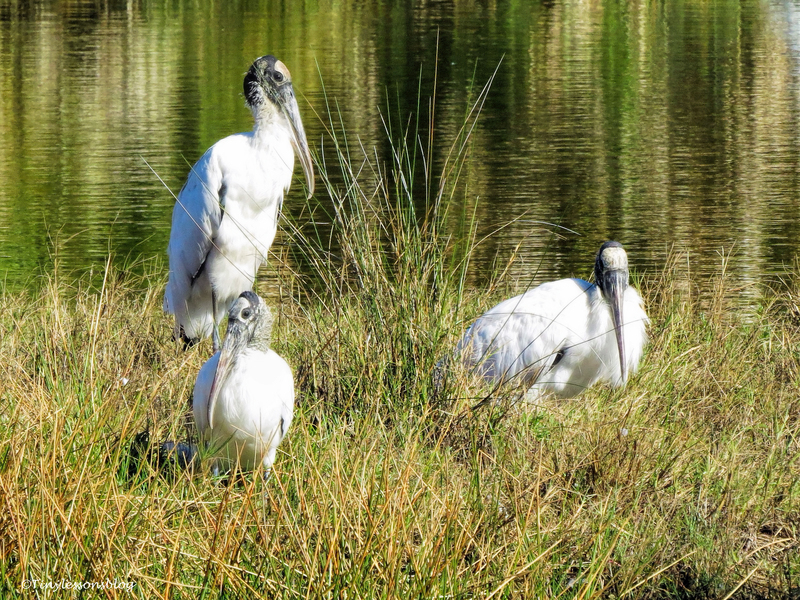 I decided to check if the residents had moved back to the salt marsh. They had! 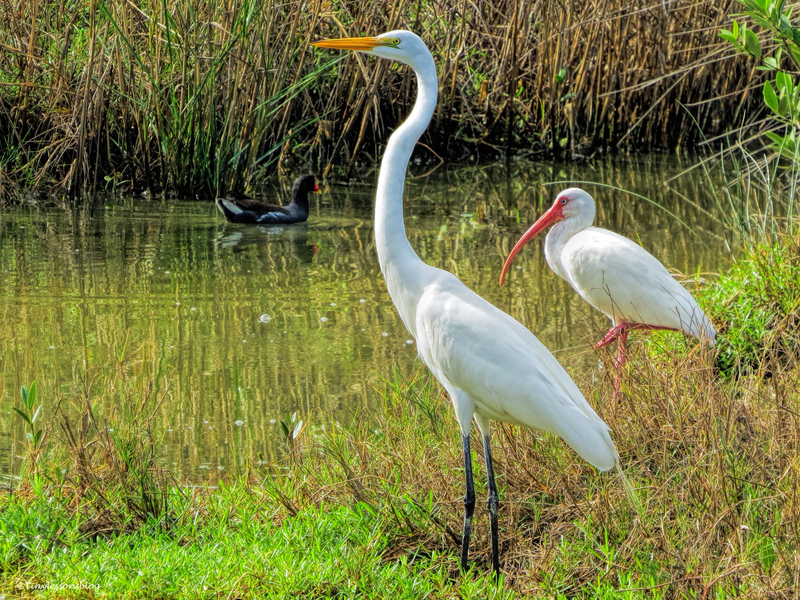 The water had receded a bit and the egrets enjoyed being able to walk around the smorgasbord. 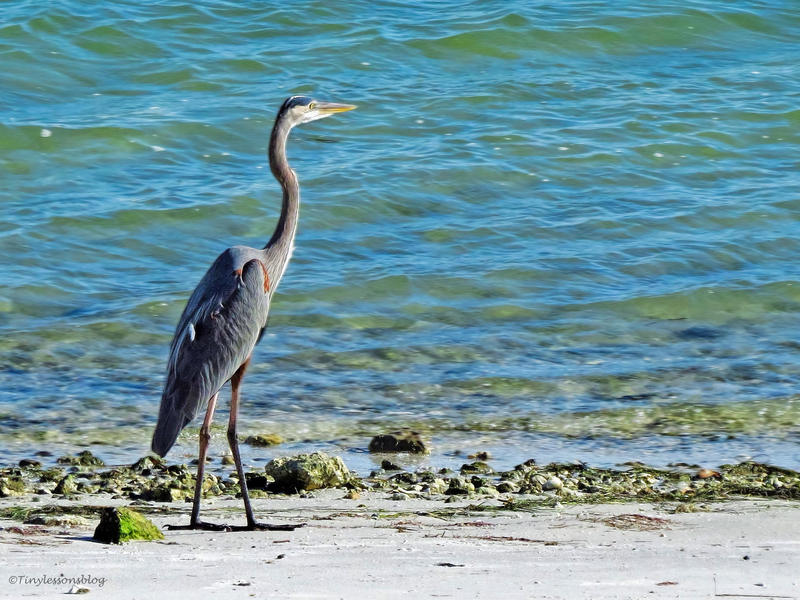 The young Great Blue Heron was there too. I have a feeling that the Major has moved on (you remember him, right?) and the youngster is trying to secure this coveted office. He is always there, and I have to say his behavior has improved. 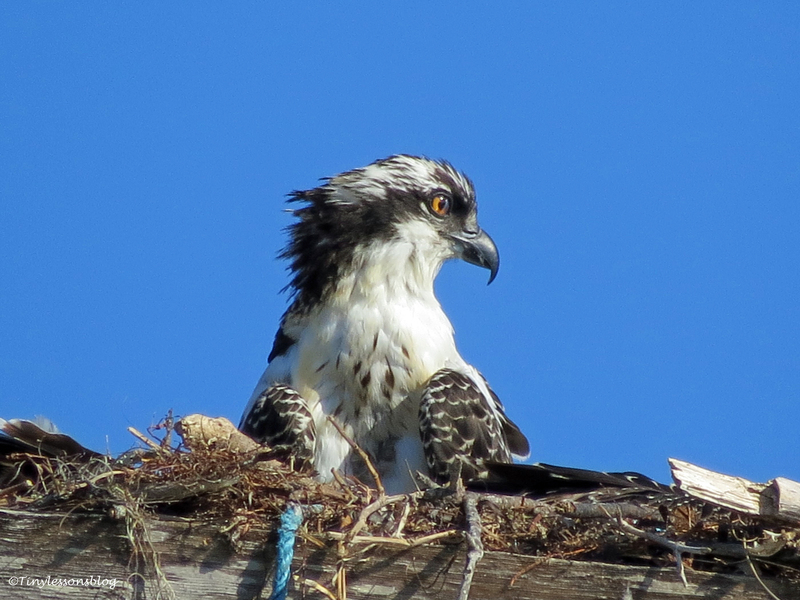 No known attacks on the Osprey nest or others lately. He has cleaned up his rhetoric. But to his surprise another candidate had surfaced. 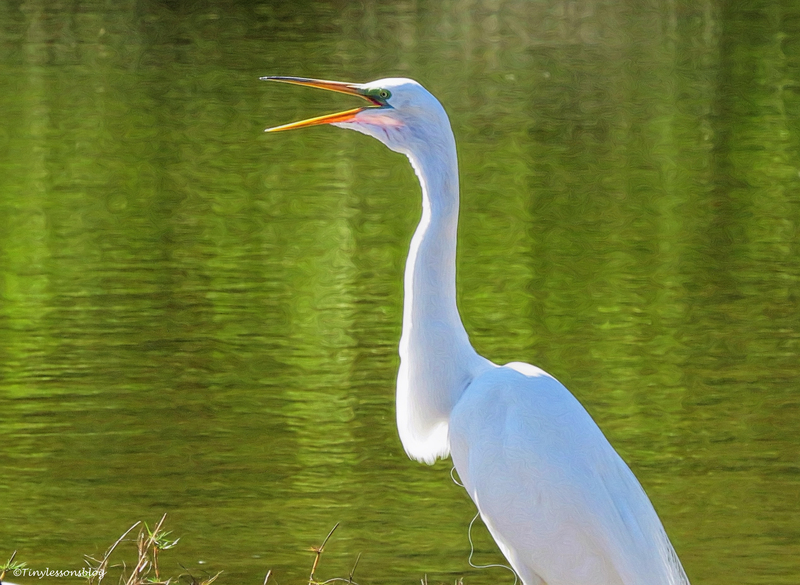 A Great Egret was speaking to the crowds. Some listened attentively and moved closer. Others turned their attention elsewhere. 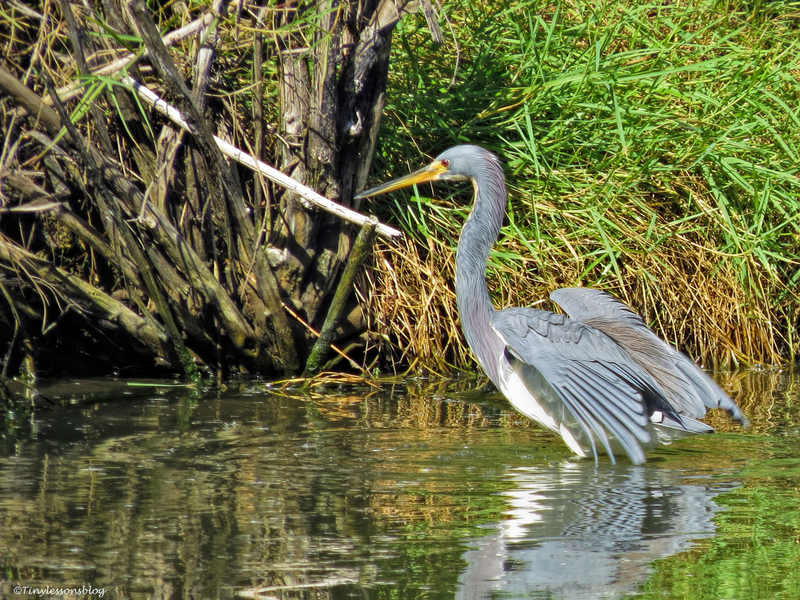 The Great Blue Heron moved closer too. I was afraid he would confront the speaker right there. But he was quiet. Probably planning to tweet his counter arguments later on. The juvenile Night Heron had never heard a speech like that and lifted his head curiously from the grass. A young Brown-headed Cowbird was curious too. It looked like the speech spoke to younger voters. But others, like Miss Rosa, who have seen and heard it all before, preferred to take a nap in the bushes. And some just didn’t pay attention to the speaker because they had some other pressing business to take care of, like this Snowy Egret. And others simply moved away from it all, like this Mottled Duck couple. Some protests were heard. 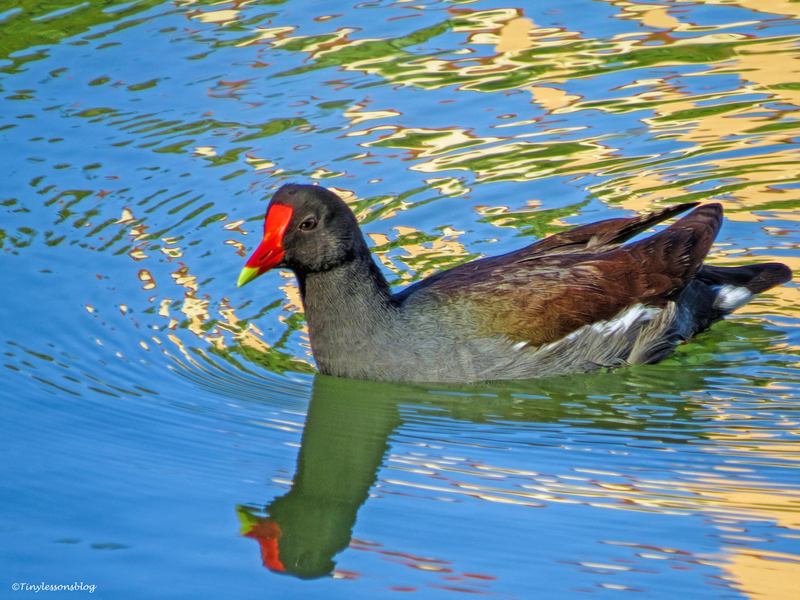 The Moorhens are known to speak their mind. You just can’t come on their turf and get away with it. And in a nearby palm tree, a Common Grackle loudly added his voice to the mix too. Soon after that the speech ended. Everybody went on with their business. Miss Rosa had woken up and scanned the landscape carefully from her hideout. Before leaving I spotted a fairly rare visitor, an adult Little Blue Heron. She had probably come to attend the rally. I was happy to see the smaller waders too had returned to the salt marsh. Yesterday it was too hot to take a long walk, but I kept an eye on Lady Cawcaw from my terrace. I could hear her asking for fish, and I spotted Mama Sandy fairly close to the nest on the bay side. I assumed she was monitoring the situation and would intervene if it got critical. 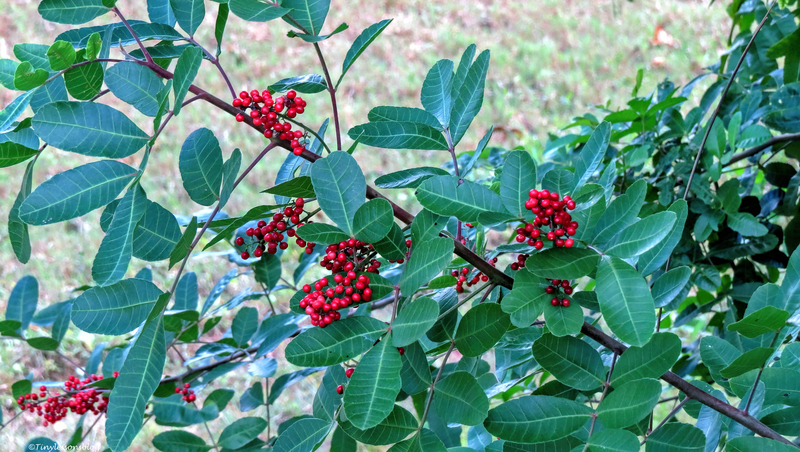 Late this afternoon, while writing this post, I decided to go out on the terrace and check on the young lady again. To my delight she was eating what looked like a whole fish. I hope she had caught it by herself. We will know soon enough. 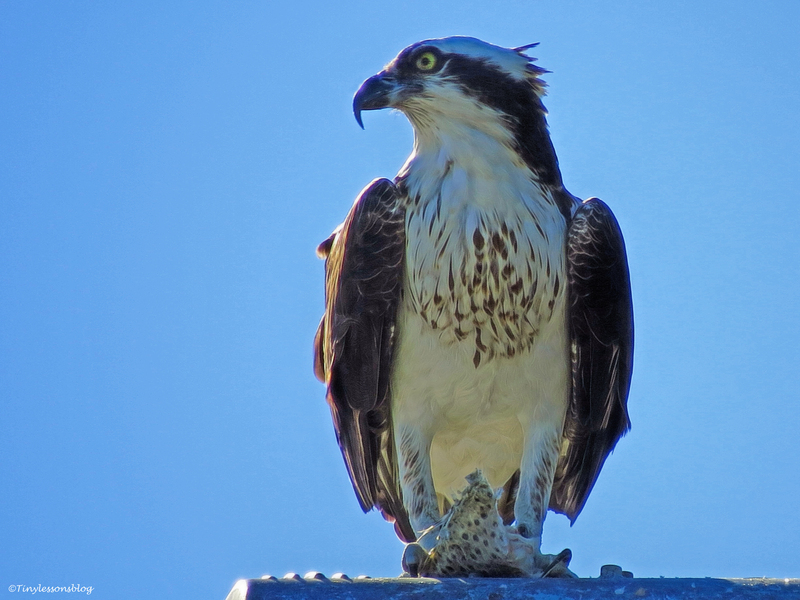 If this was her first fish, we will only see her in the nest for a few more days. But if Sandy or Stanley had brought it, she will probably stay a couple of more weeks. Thanks for reading the ‘Salt Marsh News’. We all wish you a good week. Christmas Morning at the Salt Marsh. But Don’t Come without a Gift. Please. The Christmas morning was beautiful. Little on the warm side. Okay, we were probably one of the warmest places in the country. No jacket required, not even in church. 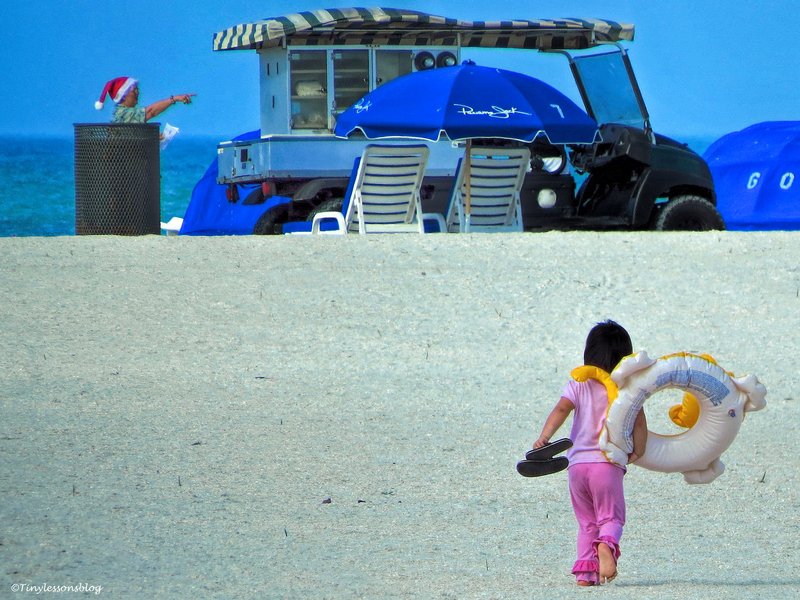 Late morning everybody was heading to the beach, including Santa. I got out too, for a much needed walk. A solitary break from cooking and eating. And eating again. I took the shortcut through our garden to the beach and then to the salt marsh. It was very peaceful. You see, the park was actually closed. No cars coming in. The birds were not many either. A couple of Great Egrets, a few White Ibis, Moorhens and several Night Herons sleeping in the bushes. This juvenile was the only one agreeable to a photo shoot. 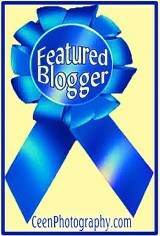 Albeit half-heartedly. 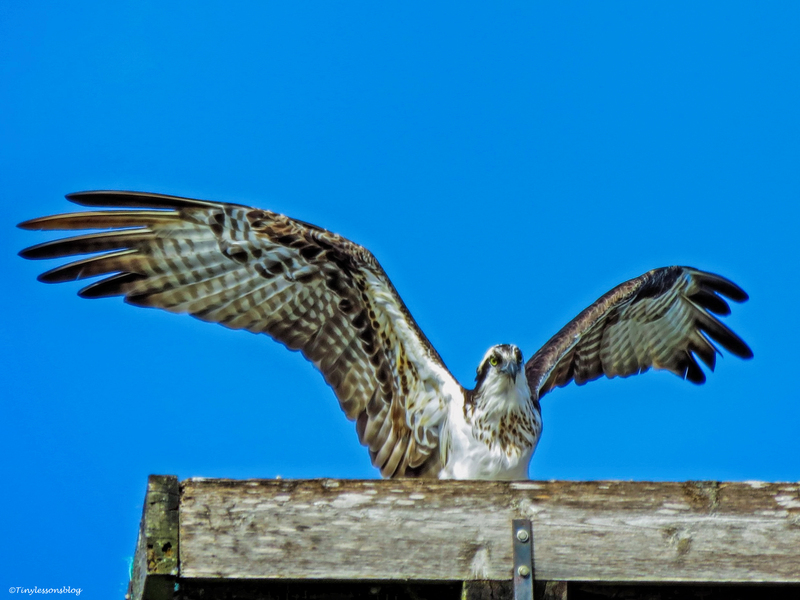 When I arrived to the east end of the marsh, the Osprey nest was empty. 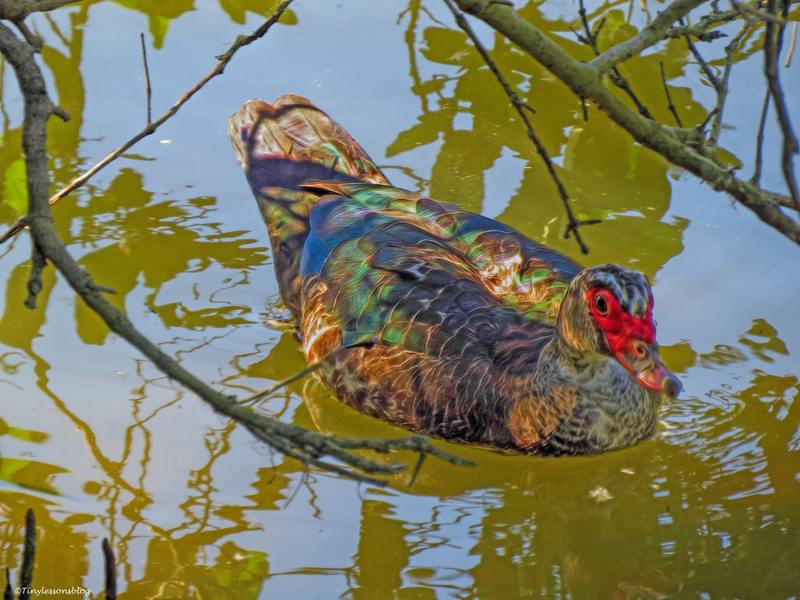 But I enjoyed the company of the “duckies” who have pretty much reserved the deep water for themselves. 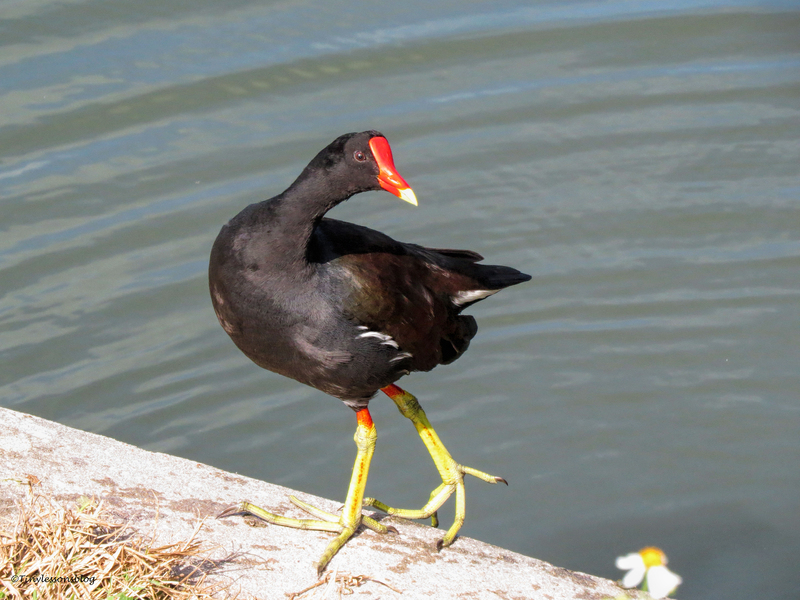 A young Moorhen came up on land and was quite funny walking the “plank” with his big feet. 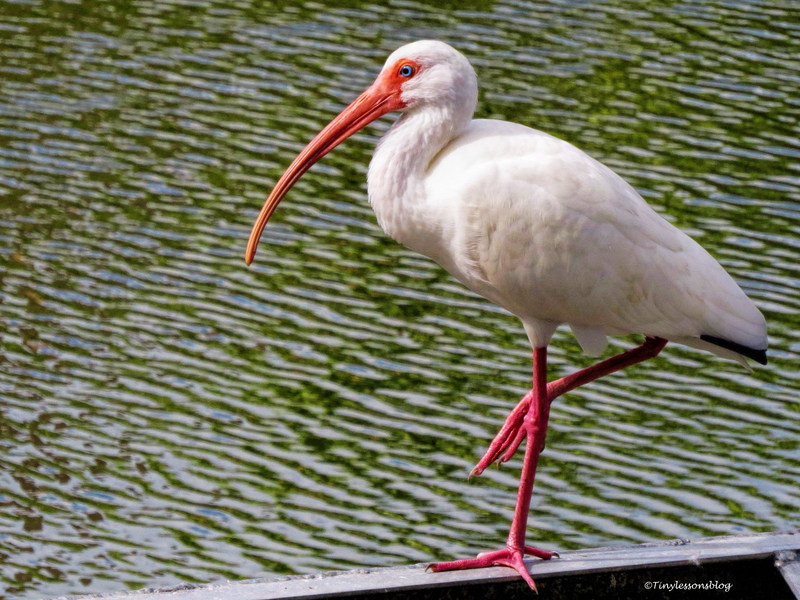 Soon the Ibis also wanted to show me his style, balancing on the edge of the installation that regulates the ocean water coming into the marsh. 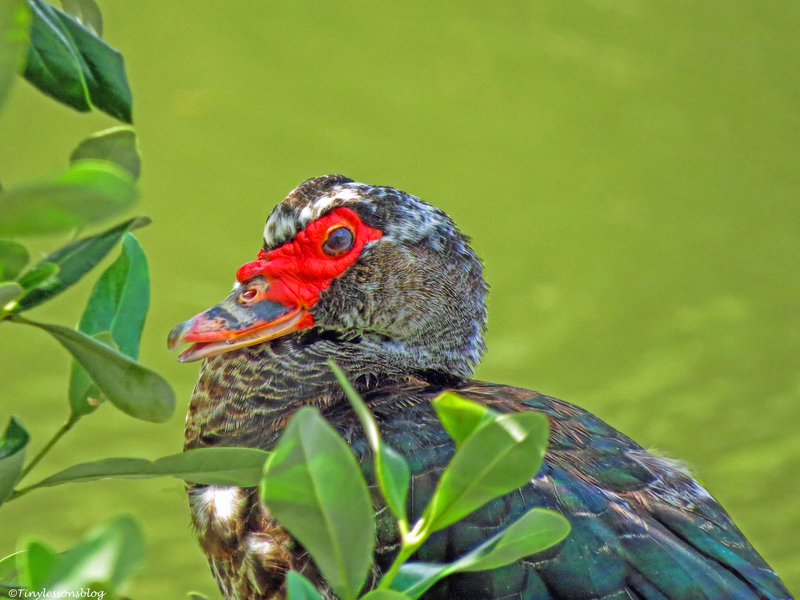 The young Muscovy duck was resting further out, at the corner of the same installation. He lifted his head to acknowledge me, but didn’t move. 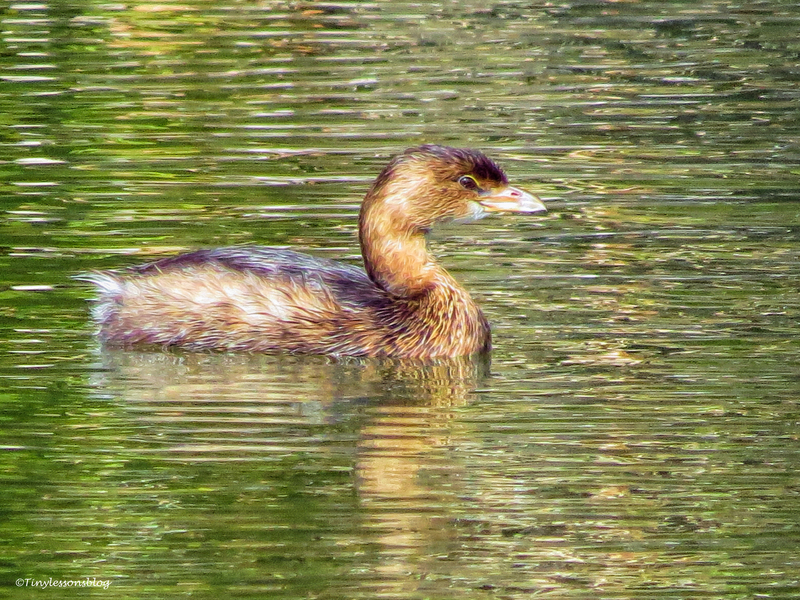 I was admiring the little Grebe, who seems to have made the marsh her home, when Mama Sandy flew into her nest. After saying hello, she settled on the back edge of the nest and scanned the skies. Looking up, I didn’t see anything interesting. And she scanned the ground too. Two unleashed dogs came running with their owner. 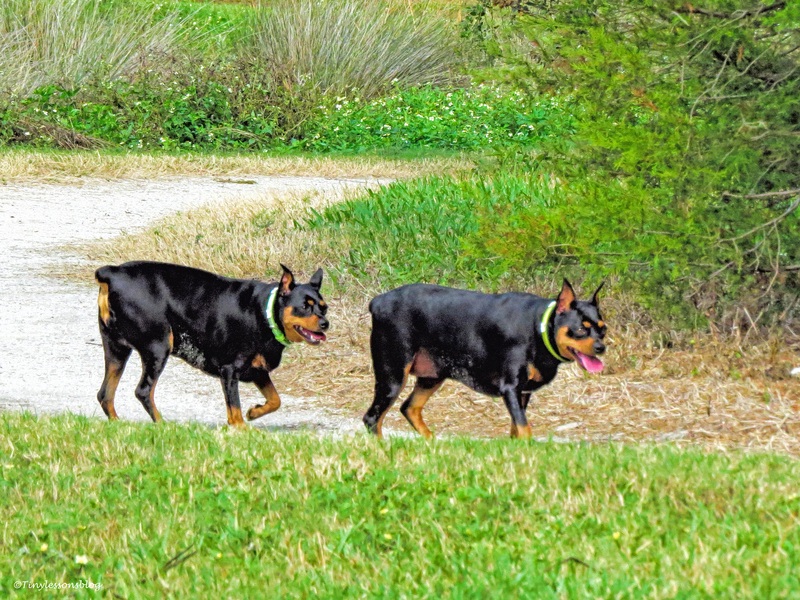 When outside the dog park, dogs must be on leash. But I don’t think they knew how to read. It’s a pity that their human didn’t either. Mama Sandy continued to stare at the sky, and suddenly she gave a sharp, loud warning. 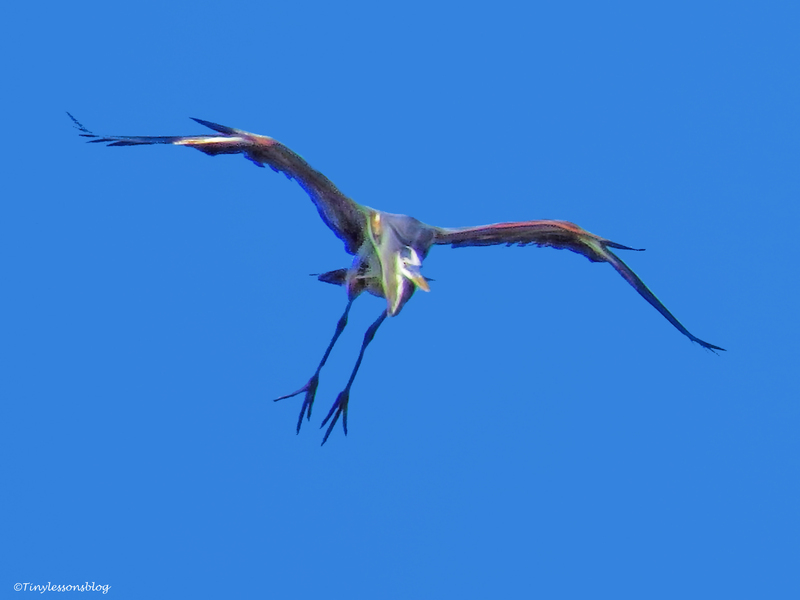 I saw the young Great Blue Heron approaching the nest with his landing gear already down. But Sandy was adamant he wasn’t welcome. Full stop. So he picked up his legs and flew towards the bay side. 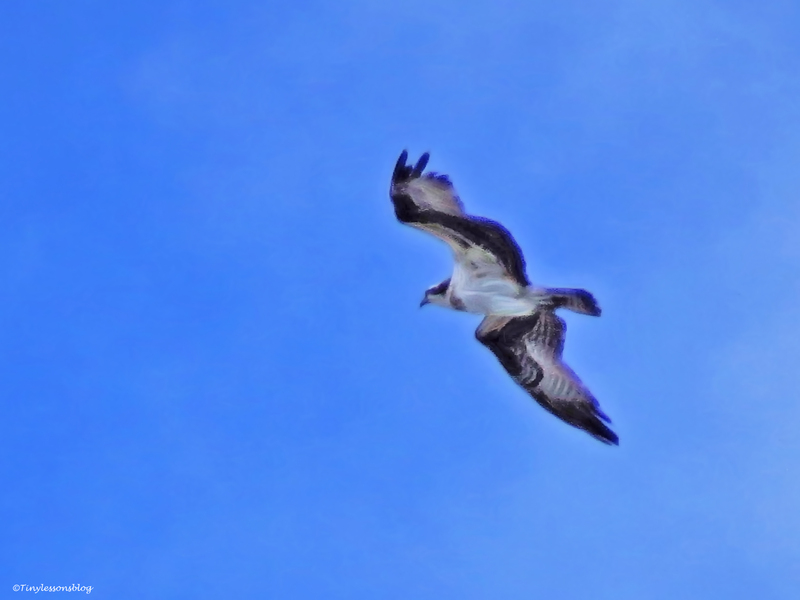 Soon after that I saw Papa Stanley fly high up in the sky, not far from the nest. And he was coming close. Very close. He was about to land, but Sandy told him not to come to the nest. Not without the customary gift! See, that’s a clear message. You don’t arrive empty-handed. Stanley changed his mind in the last minute. Sandy knows what she wants. And he knows very well he needs to bring a gift to be allowed into the nest. So he flew towards the bay. This courting is getting serious. Soon after Stanley disappeared from sight, Sandy flew away too. Maybe to check on him. 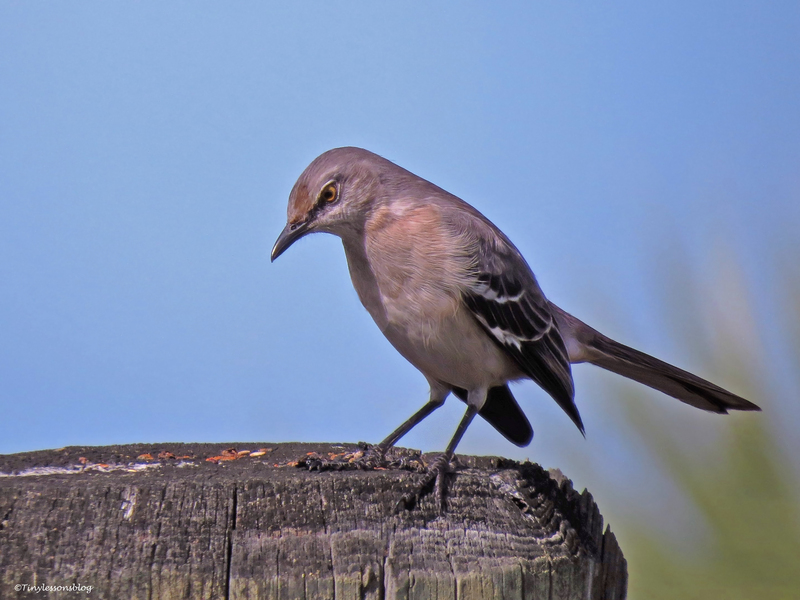 When I walked out from the park, I spotted the Northern Mockingbird again. He lives somewhere close to the wooden fence of the park. He was in deep thought. Very serious. Maybe he’s been following the Osprey saga, and was pondering where to find a mate of his own. 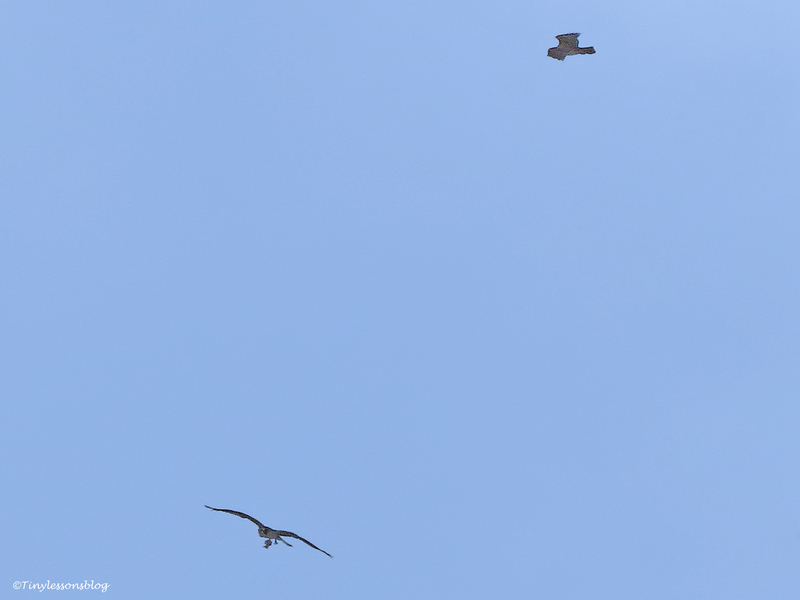 Just before arriving home, I saw Sandy and Stanley flying together very far over the bay. It looked like she would get her gift. Sooner or later. Stanley had already caught a fish. I didn’t get a good picture of the two of them as they flew so far apart, but I’ll share what I’ve got so you’ll see I’m not kidding. He clearly has a fish. In less than ten minutes. There’s hope for this romance. With that continuing excitement at the salt marsh, I wish you all a great Boxing Day! Peace.